When it comes to entertaining, it’s important to balance all of the desserts with delicious appetizers. You know me, I love my sweets but once the holidays roll around I get pretty overwhelmed by endless treats. So, today I am excited to share a delicious appetizer recipe for Spicy Taco Squares and to give you the opportunity to win a Calpahlon Self-Sharpening Cutlery Set! Having the right kitchen tools is essential when I am preparing dinner or making food for guests. It helps things go smoothly and efficiently. One of my readers recently told me that it took her an hour and a half to prepare a pie that only took me twenty minutes to make! She said had to do almost everything by hand instead of being able to use the kitchen tools that I have in my kitchen. One of those essential kitchen tools is set of premium knives. I just received this Calphalon Self-Sharpening Cutlery set and so far I love it! There are built in ceramic sharpeners in the slots, of the stainless steel part, on the knife block that sharpens the knives every time I use them. With this SharpIN Technology, I know that the knives will always be sharp and ready to use, making slicing and chopping effortless. 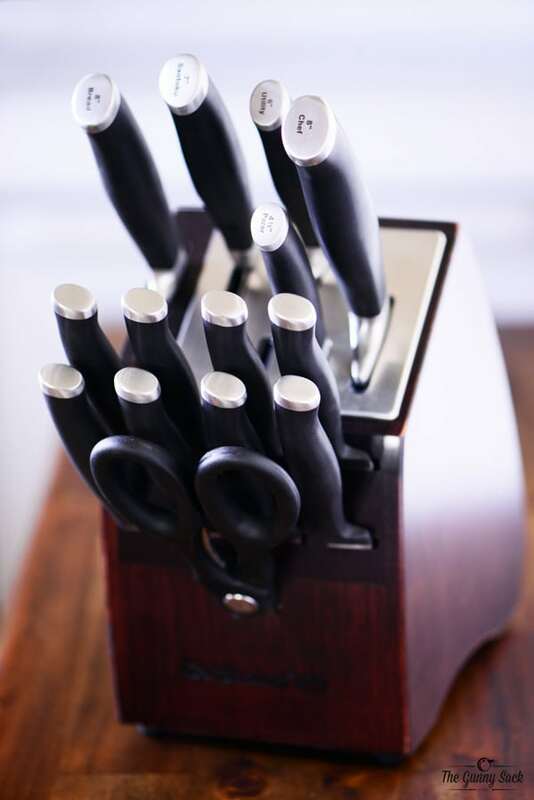 Plus, these Calphalon knives from this new line of Self Shapening Cutlery are made from high carbon, no stain, forged steel with a bolster and tang, all of which means they are high-quality knives. Along with the new line of Self-Shapening Cutlery, Calphlon has a website to help with knife skill. It is chock full of videos showing how to cut various ingredients and which knife to use to get the job done. 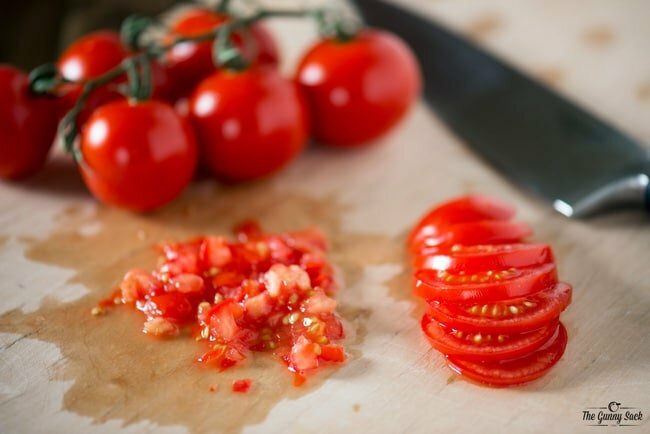 I used the tomato dicing video to help get the tomatoes cut for this recipe. To make these Spicy Taco Squares, start by cutting thawed puff pastry sheets along the fold lines (in thirds) and then cutting each strip into 4 pieces. I used my 7-inch Calphalon Santoku Knife because the small indentations along the edge of the blade help prevent the dough from sticking to it. I also used the Santoku Knife to cut the lettuce. 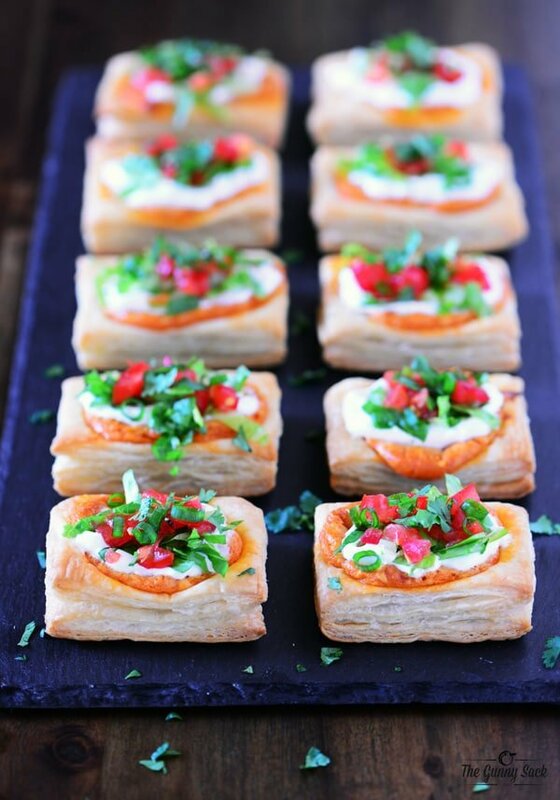 Prepare the spicy taco cream cheese and spread about one tablespoon in the center of each puff pastry. Bake at 400 degrees for 15-20 minutes. While the squares are baking, prepare the toppings. Following the instructions in the video above, I used my 8-inch Calphalon Chef’s Knife to easily dice my tomatoes. I also used the chef’s knife to slice the green onions. To cut cilantro, I love using kitchen shears. Rinse the cilantro in water and gently dry with paper towel. 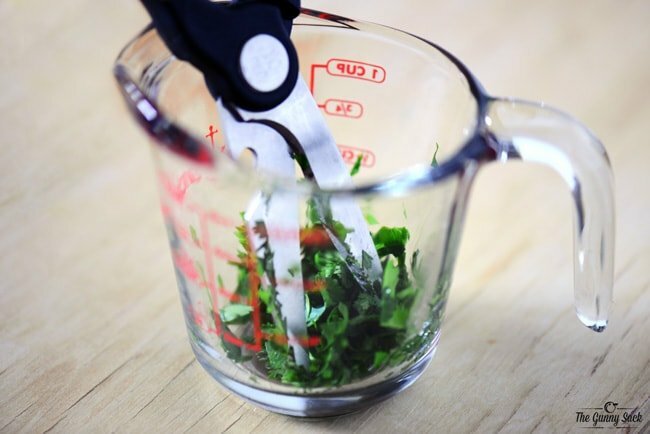 Put some of the cilantro in a small bowl and use the kitchen shears to snip it into small pieces. Once the spicy taco squares come out of the oven, top them with sour cream, chopped lettuce, diced tomatoes, sliced green onions and cilantro. You can go crazy on the topping if you want and add all of your favorites like taco meat, sliced olives, diced onions, diced jalapenos, chopped peppers and diced avocado. These spicy taco squares can be served warm or cold. If you want to prepare them ahead of time, refrigerate after preparing them and warm briefly before serving. 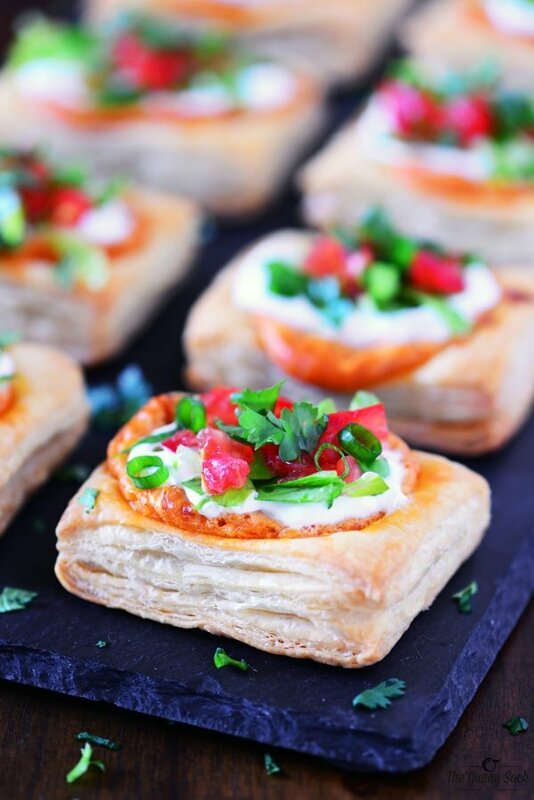 Try making spicy taco squares as an appetizer for your next party or celebration! 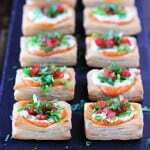 Cut thawed puff pastry along fold lines (in thirds). Cut each strip into 4 pieces. Place the squares on greased baking sheets. Beat in mayonnaise, taco sauce and taco seasoning mix. 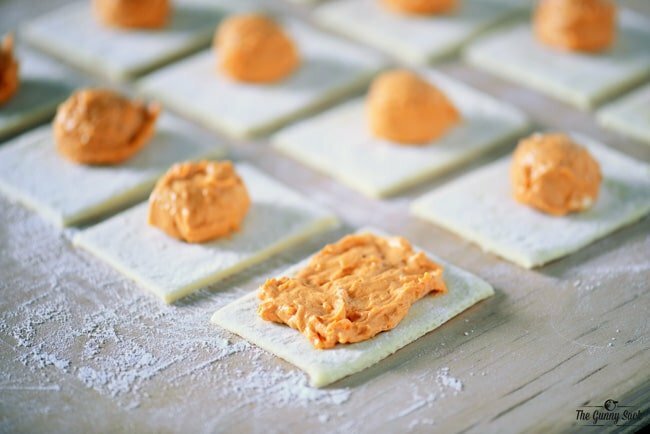 Spread about one tablespoon in the center of each puff pastry. Top with sour cream, chopped lettuce, diced tomatoes, sliced green onions and cilantro. This is a party sized appetizer with 36 servings. If you are making it for a smaller crowd, simply cut the amount of ingredients in half or in thirds. I would make potato soup then beef stew. Thanks! I would make caprese salad, and I would use the knives to get my basil leaves minced just right. Well, my hubs is off prepping for the upcoming deer hunting season. Hopefully he’s lucky this year and brings home some venison. I’d love to make some homemade jerky! And when making jerky, you’ve got to have one heck of a sharp knife to get those thin slices! We would Homemade Beef Stew with fresh vegetables. I would make beef stew with them! I want to try Spicy Taco Squares. They look so good. I’d like to use it for roasted turkey. I would make a vegetable soup with a lot of vegetables to chop. I would love to see the difference sharp knives make. I don’t cook, but my husband does, and these would be a gift for him. I am hoping he would make some delicious sweet potatoes, maybe with some bacon, truffle oil, and some blue cheese! Steak fajitas sound really good to me! Thanks for the chance! I would make steak tartar! I would make Chicken Noodle Soup for my family & use the set to cut up the garlic, onions, celery, carrots, & chicken! Thanks for the chance! Those look delicious and I will have to try them! I would totally make a cinnamon apple galette with homemade whipped topping for the holidays with these knives. They seem perfect for this recipe with all of the cutting and also with the dough! I’d fix a cheesy squash casserole. Thanks for the giveaway!